Okay, sure, not literally every 4 minutes. However, solar systems are now being installed at the rate of 360 solar systems per day, according to GTM Research. That’s 1 every 4 minutes if you average it out over a 24 hour day. Really, it’s more than that because, I assume, most solar systems aren’t being installed outside of normal working hours. As Cleantechnica points out, at this rate of growth the relatively small U.S. solar industry won’t be small for much longer. To put the growth into some perspective, back in 2006 1 solar system was being installed every 80 minutes. That’s a huge jump in just 7 years. The United States is expected to have 1 million residential solar power systems installed by 2016. Mind you, that’s something that Australia, with a much, much smaller population, has already achieved. However, Australia doesn’t have a solar panel manufacturing industry to speak of. As GTM Research maintains, solar is on an “extraordinarily fast growth trajectory” in the U.S., with two-thirds of all distributed solar having been installed over just the past 2.5 years. 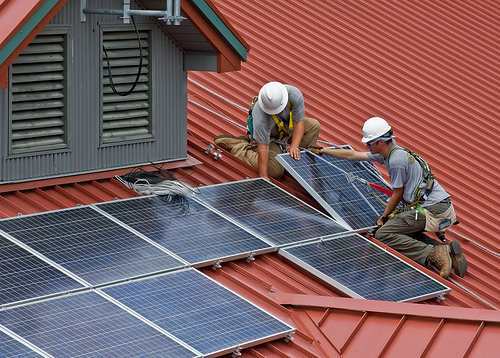 Cumulative installations of solar panel systems are set to double again by 2016. This will make the solar market 10 times bigger than it was in 2010. Next post: Electric Nissan LEAF Sales Up 230% From Last Year In U.S.